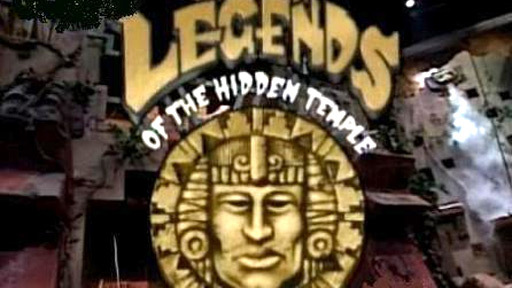 The Temple Run tasked a team of two poorly dressed children with infiltrating a massive temple, one at a time, braving the challenges in each room, dodging the dangerous indigenous population (by using pendants to bypass them, or "lives" in video game parlance) -- all in order to steal liberate an artifact and bring it out before the timer expires. It's single player capture the flag, kinda. Watching at home, you'd get a cut-away 2D camera view of the set that follows the player, voice-over commentary that narrated events (though it more often served as a hint system for disoriented players) and starting with season 2 they added a mini-map of the player's route and a HUD element in the upper-right corner that tracked the team's pendants. Who needs Starcraft II replays when you have this? The best part about the Temple Runs was their unforgiving, unpredictable nature; every episode, the route through the temple would change and they would swap some rooms out. Some rooms were very easy and only took a few seconds to get through -- while some, like the notorious "Medusa Room" were incredibly buggy and poorly designed and ruined entire runs. The best rooms emphasized player skill: the "Shrine of the Silver Monkey," where the player must put together a three part monkey statue, was sometimes easy and sometimes it ruined everything because the kid would get one piece backwards. 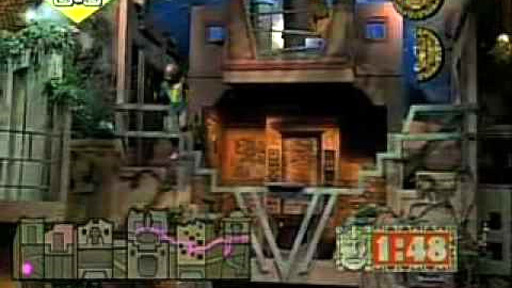 The "Pit" Room was also great for all the different configurations it allowed: sometimes there was a rope bridge, sometimes you had to swing across to a platform, sometimes you had to swing on the rope to knock over a column; the rope was always just barely within reach. The best players would swing effortlessly on the rope and use the hand holes in the walls with expert precision. I'd say maybe only a quarter of the teams actually "won" the Temple Run, which is extraordinarily brutal for a children's game show. All successful game shows are based on epic, win-big or not-at-all finales; and Legends presented some of the most epic moments. And that same level of difficulty and relative inaccessibility is what makes recent platformers like VVVVVV and Super Meat Boy stand out: no pain, no gain, yeah? He used the leash to grab the rope! That's totally a case of emergence and player improvisation; the set designers probably didn't intend for that functionality -- indeed, the host encourages him to simply reach out for the rope -- but whoa. Imagine if it actually were intentional! Great level design there. ... But then sometimes the level design just seemed plain unfair. The end of this Temple Run is utterly heartbreaking in how hopeless the situation is, as you watch the boy's spirit slowly dissolve into nothing... it doesn't help that the girl doesn't run. WHY ARE YOU WALKING?! In these playthroughs, note the importance of scale: if you were an adult playing through the same level, it'd be way too easy. In almost every room, kids have to climb to reach things -- the Shrine of the Silver Monkey, the Jester's Court, the Room of the Headless Kings; kids have to jump up to just barely reach the pieces of the monkey statue, or jump to reach a specific jester pose. The scaling is just right. Not too high and not too low. Anyway. Obviously a great show. A damn fine show. Unfortunately I don't think it would ever get produced these days -- it's not the most politically correct and American kids these days are just too fat. Good thing we can just play platformers in our browsers and get as fat as we want now, right?